In my opinion, the twilight-backgrounds look quite cool. With all those graphics, the loading time is longer of course. Do you think it is still fast enough even with modem? I don't want to make a DSL+ only page, like so many others on the net. Another change is that after writing your first comment or forum post, you should not have to write your name everytime again. This is only for one session though, so if you write a comment a few hours after your last one, you would have to enter the name again. I hope that this works on most systems (everything involving cookies and sessions seems to be highly depending on the user's systems), it works on my PC at least. We are behind by one day, but we still present you the map of the week number 3. It's the first four-player map to get motw honors on broodwarmaps.net. This MotW in highlight is The Great Divide 4 by Tuy. Tuy is a great mapmaker who puts effort in making his maps as playable and fun as possible! What he lacks in multitude he gains in dedication and his maps are very thought through! (4)The great Divide 4 is a nice combination of innovation, starforge/scmdraft fancyness and playability. The mainbases are located on low twilight dirt, but the middle is on high ground. The gameplay on the map is highly depending on the starting locations the players get, but it seems to me they are always well balanced. I had a couple of games today on the map, and all players agreed that it is a very good map. So here it is! 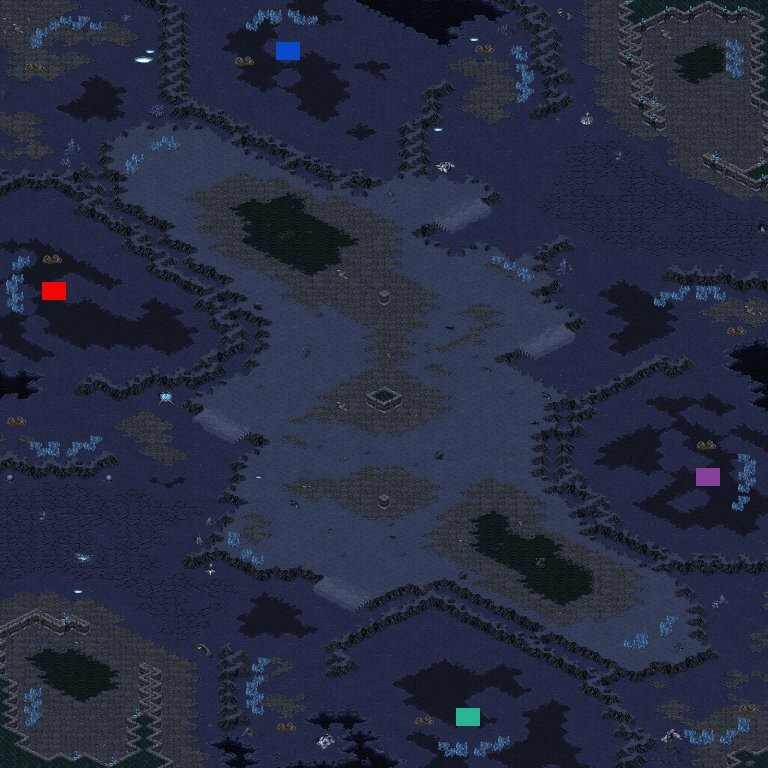 The Map of the Week 31 - The Great Divide 4 by x8_Tuy! Download melee, or visit the comment page for "the great Divide 4"
Have You visited a map comments section recently and wondered what the text "GMCS(beta)" meant? Panschk has developed a new system on the page which he calles the GMCS - Graphical Map Comment System. This is a tool which can be very helpful when commenting maps if You want to point out a specific area on the map which needs modification. The idea is that by using different marks You can pinpoint out areas on an image of the map in question. Then the maker of that map can browse this picture and see the spots You marked and read the comments you added to those spots. The idea is brilliant! Though be aware that the system is still under construction and Panschk is still trying to figure out good ways of reducing the loading time of the system (although I personally surf on a 56k and actually have no problems at all loading it). We hope that this system will be usefull and we ecourage You to start using it! Please report in the forum if you find out any bugs or other problems with it! GMCS Forum thread - Report bugs here! And then it was time to present our second Map of the Week! trcc continues to amaze us from map to map with his flawless designs and unquestionable balancing. This map is all that. With a clear concept of a central power map, this map also offers interesting passages along the sides for suprise attacks and flanking. With that said i'd like to present to you - The Map of the Week 30 - (2)The Barrens by trcc! Im gonna make this short cause im too excited myself to start making a new map and not writing a long newspost. The public makes the maps for BlizzCon invitational! links here -> Submit YOUR map!